These days the average marketer has been cited to use anywhere from 12 to a whopping 31 tools to build the campaigns of their dreams, but making sure all of these different apps or tools work together like a well-oiled machine is often where things get messy. For example, you might generate leads via your landing pages, but — depending on your marketing stack and the connections you’ve set up — it’s not always easy to automatically pass, tag and strategically route form data you’ve collected into all the different tools you need to work in (i.e. you might be using Google Sheets for lead tracking, your CRM for sales follow-up, and your marketing automation platform for triggering especially relevant email campaigns). Maintaining a simple workflow for your lead management is next to impossible if your tools don’t connect and talk to each other properly. 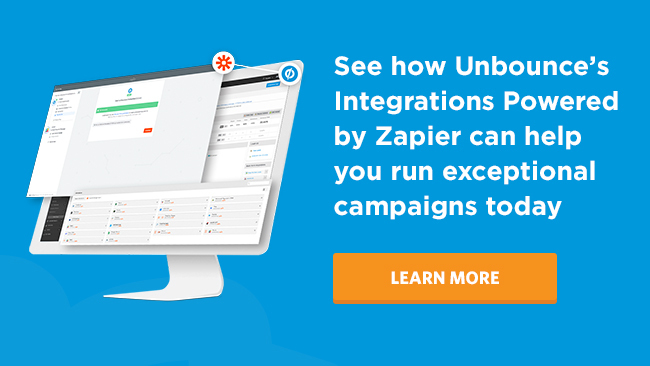 Today at Unbounce, we’re excited to introduce our new Integrations Powered by Zapier. Now, you can instantly connect your landing page, overlay and sticky bar lead data to over 60+ apps without typing a line of code or ever leaving the Unbounce builder. If you’re not already a super fan, Zapier’s the tool over one million people use to connect their favorite web apps together for less busywork and more impressive automation. It’s like the one integration to rule them all – or the tool that makes all the other tools hold hands and play nice. We’ve seen thousands of Unbounce customers build landing pages, overlays and sticky bars, then set up custom integrations with Zapier to funnel lead data into their other favorite tools like Intercom, Go2Webinar, Autopilot and Salesforce, for example. Today that connection’s even easier. Acting as a handy lead gen concierge, the new Integrations Powered by Zapier help eliminate mundane setup tasks. With pre-built Zap templates directly in Unbounce and the usual integration set-up tasks automated for you, Zapier helps you get centralized lead management for any campaign in just a few clicks. Even better? Zapier is a trade secret for leveling up the sophistication of your marketing. 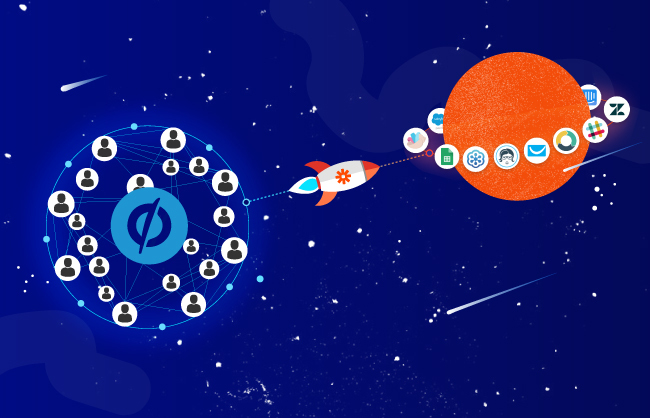 Using Zaps to connect your lead generation data with other tools and automate more actions, you can set up elaborate campaigns without needing to build workarounds or “hacks,” or depend on dev resources to build your integrations for you. The possibilities are endless, but here’s a taste of how a few of our customers are already using this feature to fuel impressive campaigns without relying on IT. It’s one thing to generate new leads, it’s another if they get routed to your sales team pronto with extra context (like a lead’s unique preferences) included. Joe Savitch, SEM and Inbound marketer at digital agency Altos, recently launched a lead gen campaign with a real estate client and wanted leads’ properties of interest included in the info submitted via the form (without the lead having to select manually from a drop down). In knowing which properties leads were expressly interested in, the real estate client’s sales team could follow up with especially relevant outreach. A sample of the lead notification Joe has automatically sent to the sales team via the Zap. Properties of interest are noted here for the sales team. The Integration Powered by Zapier was super easy to setup and execute… My client thinks I am a magician! I could see this being used a lot going forward. Want to push your lead data to other tools seamlessly? Get more info on the new Integrations Powered by Zapier, and see more Zaps available to you here. 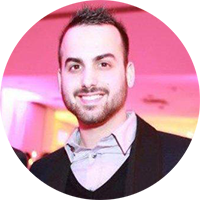 Serving many small to medium sized clients, Stefano Apostolakos of digital agency Webistry notes that many of the brands they work with don’t have, or aren’t familiar with sales CRM tools, meaning the agency can have a hard time demonstrating the ROI of the lead gen campaigns they run. But now, thanks to the PipeDrive Zap directly in Unbounce, all of Webistry’s campaign leads get pushed into PipeDrive (a sales CRM), tagged and positioned appropriately in a client’s sales funnel. Our customers have been very excited to see the direct impact their campaigns have on the bottom line. Being able to prove the value we bring has helped us to build loyalty, and generate an extensive portfolio of happy, long-term customers. Want to set up a Zap to better see your ROI? 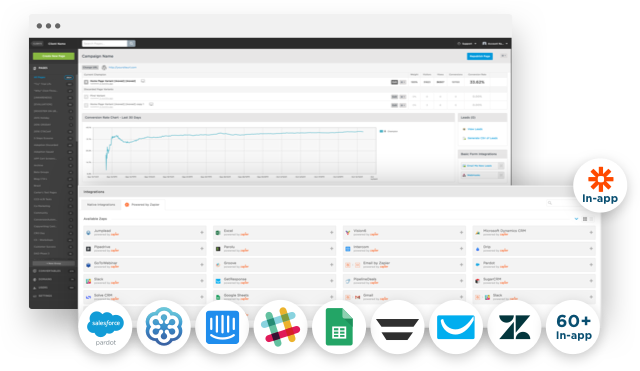 To use Integrations Powered by Zapier, you’ll need a Zapier account and Unbounce. Learn more here. This is really just the tip of the iceberg. While Unbounce now contains 60+ Zap templates to choose from right in the builder to get you started, if you have a Premium Zapier subscription, you’ll have access to over 900+ app integrations via Zapier you can make use of in Unbounce. Whether you want to use one Zap at a time, or go wild with a few at a time (i.e. lead data pushed into Google Sheets, Slack, LinkedIn and more…), today you can finally manage, tag, and re-route all the leads you collect with Unbounce (from right in Unbounce). The only limit is your imagination. You’ll simplify your campaign workflows, and all of your tools will run smoothly together. Not to mention, you can run far more complex campaigns without the help of IT. We’re psyched to be the first conversion platform to make Zapier integrations available directly in the builder, and we can’t wait to see what you Zap together. 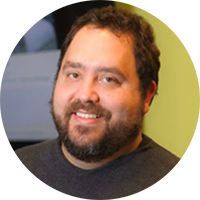 Founding partner and Unbounce's Chief Product Officer, Carter Gilchrist is an equal mix of product designer, developer and entrepreneur. With over 17 years of experience developing multiple businesses, Carter is relentless about understanding Unbounce customers, problem solving and making marketers' jobs easier.